Click here for moulded candle pricelist. Stacks of Wax make a large range of moulded candles. Listed are the colour and scent combinations we normally stock. All of these are available in both smooth and rough finish. Most of those pictured above are smooth finish, but you can see the rough finish in the yellow, dark green and hot pink images. 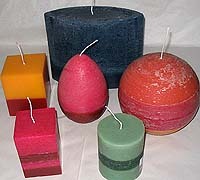 In addition, we do multicoloured layered moulded candles, some of which are pictured in the moulded candle pricelist. We can vary the colour and scent combinations to suit customer preferences if a sufficient quantity is ordered. The candles are hand poured using the finest quality paraffin wax available. We use square braid wick which sits straighter when burning than the flat braid wicks used in most candles. These wicks also give a good flame size which promotes even burning. The wicks are tightened during cooling to ensure that the wick sits straight in the candle which is critical to clean burning. It is a good idea to keep the wick trimmed to stop smoking and centred to promote even burning. Because these candles are thick they will not drip provided that they are kept away from strong drafts. The wick will sit up on top of the thinner ones and the sides will melt down into the liquid wax pool as they burn down. On the thicker ones the wick will burn down inside the candle in a hole of approximately 3 " diameter, leaving a wax outer shell that will glow when the candle burns. The candles are perfect for everyday burning at home, in restaurants and cafes, at functions and events such as launches. They are also very popular for weddings and you can see photos of them burning in the functions and parties section.